KFUMs Idrætsforbund (YMCA Denmark) is a children’s and youth organization with about 10,000 members and main activities such as camps, events and festivals which aim at children and young people. Children conquer the world through body and movement, and we can provide the right settings to support our children in developing their motor skills and to strengthen their learning abilities. 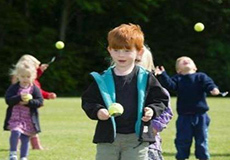 In 2012, the Danish cross-sport federation KFUMs Idrætsforbund (YMCA Denmark) established a motor skills and movement project: ‘Rend og hop med Oliver’ in collaboration with the Danish foundation, Nordea Fonden, and the Sports Confederation of Denmark (Danmarks Idrætsforbund – DIF). The idea with the project ‘Rend og hop med Oliver’ is to strengthen children’s motor skills in terms of their physical, mental and social health, and to promote their learning abilities and readiness. The day care centers receive teaching materials and visits by sports consultants to support the pedagogues and the children in the development of their motor skills. To begin with, the project has been aimed at children from the age of 3-6 years. At the end of 2013, 40,000 children in 650 day care centers had attended the project. As a result, the motor skills and movement project has now been expanded to include children from the age of 0-2 years in day cares and nurseries. By this significant contribution in promoting and strengthening children’s joy of play and movement and thereby creating the basis for leisure time activities, it will eventually benefit both the local sports clubs as well as the children’s physical and mental well-being and learning. “We are extremely proud to have the privilege of visiting 20,000 children in day care centers and 10,000 children in nurseries every year to help stimulate their evolvement through motor activities and play,” explains Secretary General, Carlo Liliendahl de Silva. Secretary General, Carlo Liliendahl de Silva became a Premium member of the Social Business Club to get inspiration from how other companies and organizations members work with CSR, to learn about the CSR mindset and the newest trends, to share hands-on experiences with the other members and to develop KFUM Idrætsforbund’s opportunities for for future collaborations and partnerships. See his testimonial in the column to the left.